“I’m not sure I understand what that even means,” Tella said. I LOVE this series – Garber has created such an original, magical, horrifyingly off-kilter world, and populated it with a cast of characters that is truly unique and wildly inventive. She has the perfect writing style for this type of story – clear and concise, but with just enough detail to bring the world she’s created into Technicolor glory. She is also terribly witty, and there are a number of one-liners that are offered as throwaways, but that often steal the scene. 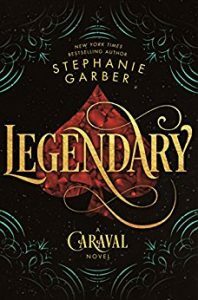 Garber plays with language and imagery the way that Legend plays with people, and the result in both instances is delightfully dark and deliciously funny. 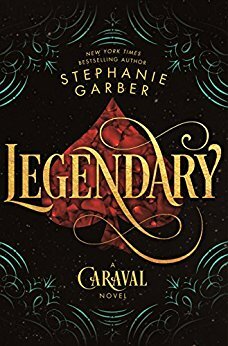 It’s that type of moral ambiguity that I think makes the characters in this series so marvelous – they have a depth and breadth, a psychological heft if you will, that ebbs and flows like the tides and leaves you a little uncertain where they stand at all times. It makes every page a thrill, because it is almost impossible to guess when they will zig and when they will zag – or when they’ll decide to go with neither and instead stop for coffee… It keeps you off-kilter, right along with Scarlett and Tella, and that’s a fun place to be when you don’t have to worry about paying the consequences like they do! He tasted like exquisite nightmares and stolen dreams, like the wings of fallen angels, and bottles of fresh moonlight. He was like a moment in time; he could be experienced but never held on to. Speaking of which, I’m also insanely curious to see what comes next… There’s no way Garber can stop writing in this series now, there are too many loose ends and possibilities laid out at the end of this one. Which is a Very Good Thing, because a world like this deserves more than two visits!